A community celebration at Riverbend Park (Bend, OR) on August 13 will include feature music performances, local vendors and a beer garden including a special craft brew from Deschutes Brewery. 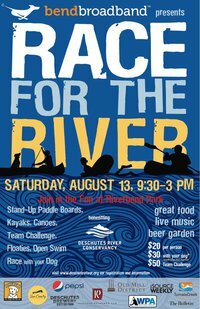 Help us spread the word about this unique event that celebrates and supports the Deschutes River! Since 1996, the Deschutes River Conservancy has worked to restore streamflow and improve water quality in the Deschutes Basin. Over the past 15 years, DRC projects have restored more that 116 million gallons of water per day, back to our local rivers & streams. Take a look at this excellent video featuring restoration of Wychus Creek. The Deschutes River has been the lifeblood of Central Oregon for thousands of years. Naturally, the river means different things for different people. It can mean water for wheat and water for drinking. It can be where salmon spawn and where nets are cast. It can be a place to simply reflect. We may look at it differently, but we love it equally. And so we’re equally affected by the problems facing the river today. The Deschutes River Conservancy was formed to restore streamflow and improve water quality in the Deschutes Basin, through the close collaboration of everyone who cares about it – farmers, recreational enthusiasts, ranchers, conservationists, tribal communities and, we hope, you. By participating in the fun float events and the SUP race events (even if you are slow and meandering in your “racing” style) you can have a great day on the water while supporting the cause for healthier waters. This entry was posted in Rivers by Water Words. Bookmark the permalink.